Hello everyone. On Tuesday night I was invited along to an event at the Sleeping Beauty Salon. The Edinburgh branch of the salon is located on William Street which is in the west end, just off Princes street. They also have branches in Inverness and Lerwick. I met up with Abby and Kirsty before hand and we headed along, not really sure what to expect. Upon arriving at the salon we were offered cupcakes and a cocktail and given a little run through of the treatments available at the event. They were doing manicures, pedicures, party lashes and eyebrow waxing/threading! I'd actually just taken some calgel off of my nails before so I knew that I'd love a manicure! Before I had my nails done I had a little wander around the salon and took some photos. It had a really nice atmosphere to the place. They had a brown and green colour scheme which was actually really nice. It makes a change from the harsh white and reflective surfaces you get in some salons. They had some music playing as well that was really relaxing. It had a very 'bohemian' feel to it and I instantly felt comfortable. The cocktail I was given was a peach mojito. I'm not usually a big mojito person but I really liked the addition of the peach because they're my favourite fruit! There was a mixologist on hand to make cocktails and they all looked so nice. The cupcakes were very nice(extra may have been taken home in my bag but I'm not at liberty to say ;) ). One thing that I really noticed about the salon was that it smelt amazing! They have their own branded candles which smelt gorgeous. There's a little one in the goodie bag we got and I can't wait to burn it. Anyway, onto the manicure. I opted for a shellac manicure because I absolutely love shellac/calgel. Because I work with water my nails will chip really easily with regular polish. The shellac manicure takes about 30 minutes and each coat is cured with a UV lamp. They last at least two weeks chip free which is an absolute god send for me! The woman who done my nails, Lauren, was really lovely and chatty. I felt really comfortable chatting with her and she was really friendly. Although choosing a colour was a bit of a struggle! The colour I went with is such a gorgeous sparkly blue, I definitely made the right decision. I also had my eyebrows waxed. I took some before and after photos but they aren't great as I had a lot of product in them before hand. We went downstairs into one of their treatment rooms for the waxing. My mum is actually a hairdresser and beauty therapist so I've never actually had my eyebrows waxed by someone else. It was actually a lot less painful so I think my mum must enjoy it too much. I joke, they use a different type of wax. The waxing bed was so comfy, I could have fallen asleep! 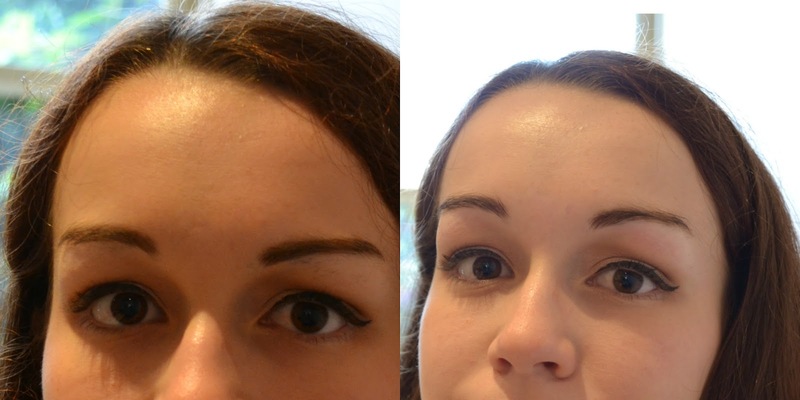 I'm really happy with how they turned out, I would definitely go here to get my brows done when I live in Edinburgh and can't just pop through to my mum's salon. Overall I was really impressed with the Sleeping Beauty Salon. I think it's a real hidden gem in a nice part of town. We were given a really generous goodie bag as well containing some Elemis skincare goodies, St Tropez bronzing mousse, soap, a candle and some chocolates. A big thank you to the lovely people at Sleeping Beauty Salon and Alison Jameson Consultants for organising the event, you absolutely spoilt us!